Why spend money on losing weight when it’s mainly a question of common sense? Diets are a relatively new phenomenon, unless you count the biblical “milk and honey”, “bread and fishes” or the Roman “wine, women and song” as diets. 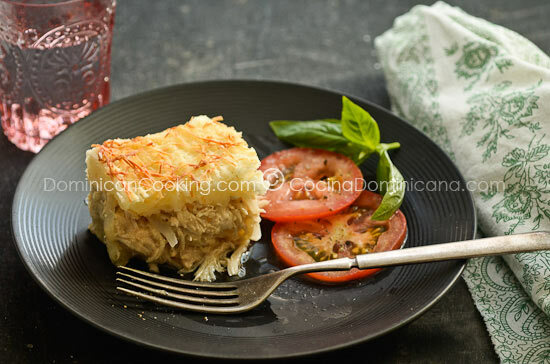 Pastelón de Yuca Recipe (Cassava and Chicken Casserole): A one-dish meal that is worth trying, if you find yourself in possession of some yuca (cassava). Cut the cassava into small pieces and boil until it is cooked through, after adding salt to the water. Remove from the water and discard the water. Mix yuca with milk, butter and egg and mash until it becomes a soft puree (if you have a potato ricer, use it to obtain a smoother puree). Set the cassava puree aside. Mix chicken breasts, cilantro and garlic. Cover with water and add 1 teaspoon of salt. Boil until chicken is very tender, adding water if it becomes necessary. Cool to room temperature. Remove chicken from the liquid (you can save it and use it as chicken broth). Shred the chicken into very small pieces. Season with salt to taste. Reserve. Pre-heat oven to 450 ºF [230 ºC]. Butter a mid-sized baking pan 8 x 8 inches [20 x 20 cm]. Spread half of the mashed yuca, smoothing it out to obtain a level layer. Top with the chicken filling, spreading into a level layer. Top with the remaining mashed yuca. Spread and smooth it with a fork. Sprinkle with the Parmesan. Bake until it is heated through and the top turns golden brown (15-20 mins). For the filling, you may use vegetables, chicken, and beef (or just use cheese), but this creamy chicken goes perfectly well with the yuca. If you want to save some time, use supermarket roasted chicken for the filling, shred it, and skip the step in which you boil the chicken, proceeding with the remaining steps as instructed. I’m dying to make this. I too have the frozen yucca rallada (2lbs) and would like to use it however I’m not sure what to do with it. Do I take it from frozen and boil it until soft or do I defrost it first? Also, in place of the 4 chicken breasts, can I use the meat from one or two rotisserie chickens? Thanks! I love what you’ve done with your site; I’ve been following your recipes for quite some time now! Omg.. so going to try this version. The one I make is with ground meat and has no cheese. I just LOVE Yuca and am always looking for new ways to make it. My mom and I are dying to try this recipe. I bought some frozen yuca rallada at the supermarket but now we’re debating whether it’ll work with this recipe. What do you think? Are there any changes I could make so I can put that big frozen pack of yuca to use ;)? As a matter of fact, frozen yuca is best used for this recipe, as it tends to get a bit mushy, which is perfect here. Go ahead. At what temperature should this casserole be baked? The recipe states to preheat the oven to 450 degrees. That’s what you will be baking it at.